Johnny Robinson's early film career began in San Francisco in the 1970's with actor/director Curtis Imrie. 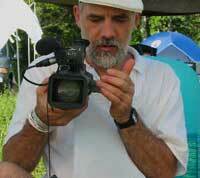 Johnny worked on low budget dramatic feature films as well as documentaries on outdoor themes. During the 1980's Johnny turned to graphic design and illustration. 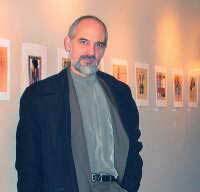 He entered Syracuse University in 1984 where he received his BA with honors in Illustration and then a MFA also in Illustration. During that time and afterwards Johnny ran Open Figure Drawing which thrives to this day as a non-profit. 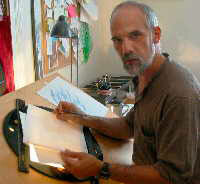 In 1991 Johnny started commercial animation with producer Bruce MacCurdy in Syracuse New York. This led to work in a local animation studio; Animation where Johnny cartoon animated TV commercials and interactive games. Johnny began teaching animation at Rochester Institute of Technology in 1999 and served as Animation Department Chair from 2000 to 2003. Since 2004 Johnny has released 4+ personal films, including Visual Lyrics, Dr. Zond Controls the Weather and The Heart Of Tango and Celeste Above. In June of 2009 Johnny moved to Urbana Illinois where he started Champaign Movie Makers and began establishing himself in the community. 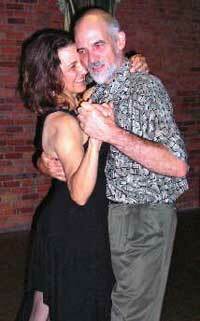 Johnny's interests include, argentine tango dancing, figure drawing, writing, wilderness camping and running.